If you were to take the red plumage from say, a cardinal, and grind it up into a powder, it would still look red. If you were to take the plumage of a bluebird, and grind it into a powder, it would look colourless. The big difference between the colour of the two feathers, is that one is caused by pigments (in the cardinal case, by red pigments) absorbed by the bird through its food, and the other is caused, not by pigments, but by the structure of the feather. Structural colours, as they’re called, are generated by light interacting with a three-dimensional structure (in the bluebird’s case, the structure of the feather). When the bluebird feather cell grows, complex keratin structures are formed. When the cell dies (feathers are made of dead material), the liquid inside them dries, leaving the keratin structure intact. Red and Yellow light cancel each other out, when they pass through the structure, but blue light is unaffected. It is quite a feat of evolution for organisms to be able to build such precise nanostructures. 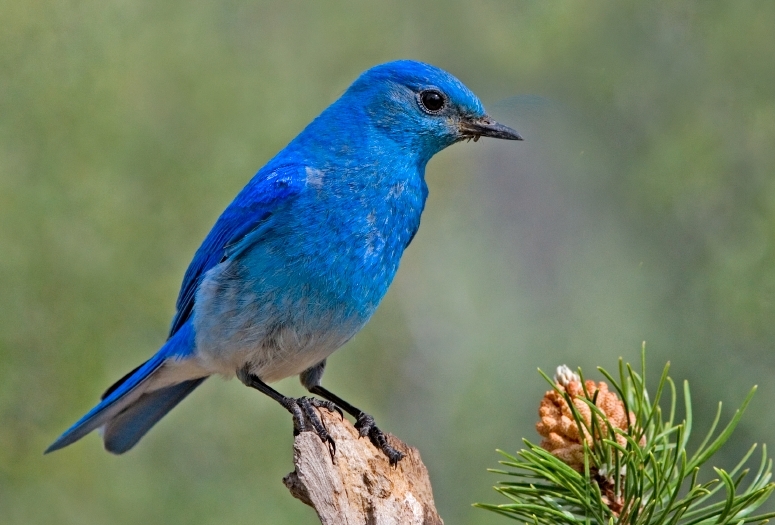 Bluebirds are not the sole users of structural colours. Many butterflies use them, and so do some plants. There are a few mechanisms that are used to generate structural colours, includiding diffraction grating (as seen in the butterfly picture below) and photonic crystals, which are ” optical nanostructures that affect the motion of photons in much the same way that semiconductors affect electrons”. The Emerald Swallowtail butterfly has “micron-sized bowl-shaped pits” in its wing structure. These act as ‘selective mirrors’. The sides of the pits reflect only blue light, and the centres reflect only yellow light. Combined, the butterfly looks green. The berries of Pollia condensata have the strongest blue coloration in nature. Spiral chitin structures cause what’s called Bragg reflection. Some animals, like cuttlefish or octopuses, can change colour at will, by altering the nanostructures in their skin that filter light. Very informative! I knew there were more types of coloring than pigment, but never really sure how they worked. Definitely interested in learning more about this. Thanks! We will definitely do more about colours, as I find them quite interesting. Maybe next week (if I get the research done in time).